With 8 rooms, 5 in the main lodge and 3 in our detached “Forest House”, we are the perfect place to get away, relax and commune with nature. The Lodge has over 400 feet of river frontage and 5 acres of gardens with numerous areas to rest and relax. All rooms are set up to house only 2 people, with one room (Damselfly) able to host up to 4 people (with 2 queen beds in 2 bedrooms). If you have more than 2 people (unless one is an infant under a year of age), you must book the Damselfly room. We have one room that can accommodate ADA guests (Caddisfly) – see further information below. Relax in the jetted tubs of Mayfly or Songbird; have a glass of wine in front of the fireplace in Dragonfly or Songbird; or just sit on one of our outside decks while communing with nature! Amenities include: Complimentary Wi-Fi, small refrigerator, microwave and coffee maker and coffee packets, robes and luxury toiletries. All stays include a full cooked to order breakfast each morning and a complimentary glass of wine and snack in the afternoon. We also offer the option of dinner with a private chef in the evening (extra charge). Please contact us for more details about the Chef’s dinner. While our Lodge was built before ADA requirements were in place (in 1946 – with the last major room addition in 1979), we do have one room that may be suitable for people with physical disabilities – the Caddisfly Room. The Caddisfly Room is on the ground floor and has extra wide doors (for wheelchair access). The bathroom is equipped with grip bars and has a roll-in shower with hand-held shower head. The room has one queen bed and is our smallest room. It is easily accessible from the parking area. Guests also have use of a wooden ramp to the main lodge to make it easy to get into the Lodge for breakfast. The only wheelchair accessible bathroom is in the Caddisfly Room. Depending on the nature of your disability, other rooms may also be suitable (ground floor, but no wheelchair access). Please call us at 541-822-3630 to discuss further. Fur buddies (dogs only) are only allowed in rooms in the Forest House (Songbird, Mayfly and Caddisfly) There is an additional charge of $25 per dog per stay (no more than 2 dogs allowed in a room). Bookings for dogs must be made via phone (not online). Rules for dogs include: must be on a leash at all times on the property; no excessive barking/disturbing other guests, no wet dogs in rooms, no dogs on beds, no dogs in or around the main lodge building; dogs may not be left alone in rooms (you can put them in your car while dining – or you can bring a crate and they can be in there while you are dining). If you have questions about your fur buddy, feel free to give us a call. Additional charges will be added to your bill if your dog damages anything in the room or on the property. 1. Is the SA needed because of a disability? 2. What work or task has the SA been trained to perform in order to assist the person with the disability? Dogs or therapy animals whose function is to provide comfort or emotional support do not qualify as Service Animals according to the ADA, even with a doctor’s note. In order to establish a dog is a Psychiatric Support Animal (PSA) and protected by the ADA, we need a letter – on letterhead – from a licensed mental health care professional saying the dog is necessary to help the individual manage their disability from their mental illness. SAs must be allowed to accompany the guest with a disability everywhere guests are normally permitted, but must be harnessed, leashed, or tethered, unless these devices interfere with the SA’s work. Individuals who cannot use such devices must maintain control of the animal through voice, signal, or other effective controls. SAs should not approach other guests and must remain quietly at their owner’s feet when seated. Finally, there are many websites that sell various certification packages, including documents, ID cards, tags and vests, however, there is no documentation recognized by the ADA nor Justice Department that proves a dog is a Service Animal. We have numerous parking spaces on a level gravel parking area. The parking space for the handicap accessible Caddisfly guest room is very wide and can easily accommodate a van with a lift. Since we do not have set-width parking spots, we can easily block off an area for a large handicap accessible van. We do not have any covered parking areas. Exterior routes to/from various first floor rooms (Mayfly, Caddisfly and Songbird) are via gravel walkways. The handicap accessible Caddisfly guest room is accessed directly from the path/garden area. Handicap access to the main lodge is in the back, so a wheelchair would need to go across gravel and grass via a wide ramp. Public/common rooms in the main Lodge are accessed through either a front door with five steps or the backyard ramp. The backyard ramp allows wheelchair access to the lodge as there are two doors that can be opened to make a very wide access (70 inches). There is no registration counter. We greet each guest individually, so if a guest is handicapped, we will greet them at their car to assist, if needed. The door entry to the main lodge has one lever action opener, which is easy to operate. The doorway is 35 inches wide, however, there is a second door that can be opened to make the access area 70 inches wide. We do not have any automated doors. Someone must manually open/close all doors to the lodge and guest rooms. There are no key readers. All rooms are accessed using regular keys. The entry door to the accessible Caddisfly guest room features an easy to use push lever. All doors are manual; none are automatic. Once inside the main Lodge there are two guest rooms, but you must climb stairs to get to them. There is a public bathroom on the main level, but it is not wheelchair accessible. Our public area bathroom is not handicap accessible. We do not have any signs on the walls. The guest rooms have signs on the doors, but they are not in Braille or raised letters. We show each guest to their guest room and explain the room’s details. We have no signage at the Lodge. Food in the main lodge is served to the guests at breakfast. Anyone needing extra assistance is personally helped. We would be happy to bring breakfast/wine to the handicap accessible room so a guest does not have to come to the main common area to dine. If we have a handicapped guest, we reserve seating for them near the back ramp/door (if necessary) and assist them in entering/leaving. We do provide self-service coffee/tea/juice at breakfast. However, we are always willing to serve a guest who has any issues walking/seeing/hearing. Juice and coffee areas may not be fully accessible to handicapped guests, in which case we personally serve the guest. We do not have a drinking fountain, elevator, or public phone. 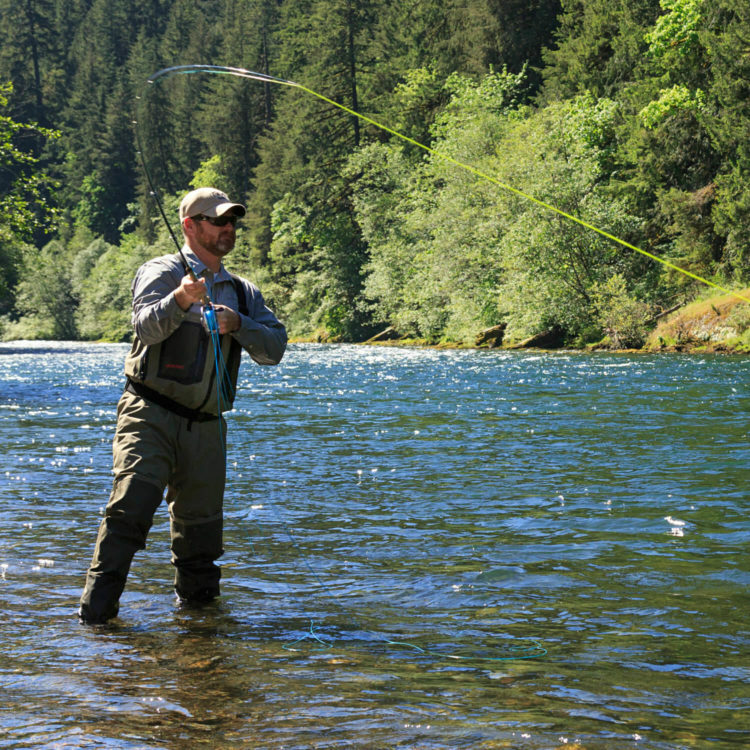 When you stay at Eagle Rock Lodge near Eugene, OR, you get to experience the Cascade Mountains and the historic McKenzie River at its finest. We provide comfort and luxury to complement your adventure on the river or in the mountains. Please review our policies below, and if you have any additional questions or would like to make reservations, please call 541-822-3630 or e-mail. Reservations can also be made online. Check-in time: 3-6 PM. Self check-in after 6 PM. All reservations require an advance deposit of one night (for bookings of one or two nights) and 50% for bookings of more than 2 nights. A $25 fee is charged for all cancellations. We require 14 days’ notice for all cancellations – if you cancel less than 14 days in advance you will be charged for the entire stay unless we can re-rent your room (in which case we will refund any amount that we were able to recoup). Two night minimum stay on weekends “in season” (May – September) for any Saturday reservation. May apply on other weekends for special events. No smoking on porches, patios, decks and anywhere indoors. Smoking is permitted in designated area outside only ($100 cleaning fee for violations). Please ask Innkeepers for directions to smoking area. Please note that smoking may be totally banned during forest fire season or if county regulations restricting smoking are in effect. Well behaved pets are considered on an individual basis (extra charge would apply) in certain rooms (Caddisfly – up to one dog; Mayfly – up to 2 dogs; Songbird – up to 2 dogs). All pets must be kept on a leash while on the Lodge property. Room rates are for two people and include full breakfast and a wine/snack hour each afternoon; rates are subject to change without notice. The only room that can hold more than 2 people (including children) is the Damselfly Room which holds a maximum of 4. Please note that 4 adults in the Damselfly Room makes it feel very crowded – it is best suited for 3 adults or 2 adults and 1 or 2 children. If you are traveling with an infant (Under 1) please advise us in advance. Bookings of multiple rooms may require 50% deposit and have a 60 – 90 day cancellation policy. Early departures WILL be charged for the reserved time period. Because last minute cancellations greatly affect us, our cancellation policy is strictly enforced. Children are allowed in the Damselfly Room, however we have no roll-aways, cribs, high chairs etc. The only room that can accommodate more than 2 people is Damselfly – additional charges apply for more than 2 people in that room. Please remember that we do not allow a child (other than an infant) in rooms designated for 2 people. If you have a loud, rambunctious child, this may not be the right place for you since most of our guests are here for rest and relaxation. The McKenzie River has a very strong current and is very cold. Small children and/or pets should not be allowed near the river without a supervising adult. Lost key charge of $35 for any keys not turned in upon checkout. Items left in rooms or on the general Lodge property will be held for no more than 60 days – it is up to the owner of the property to contact us to make arrangements for pick up or shipment of the lost/misplaced item. If we need to send the item to you, you will be charged for mailing costs (including envelope/box if required). All items unclaimed will be donated to St Vincent’s (Charitable organization).